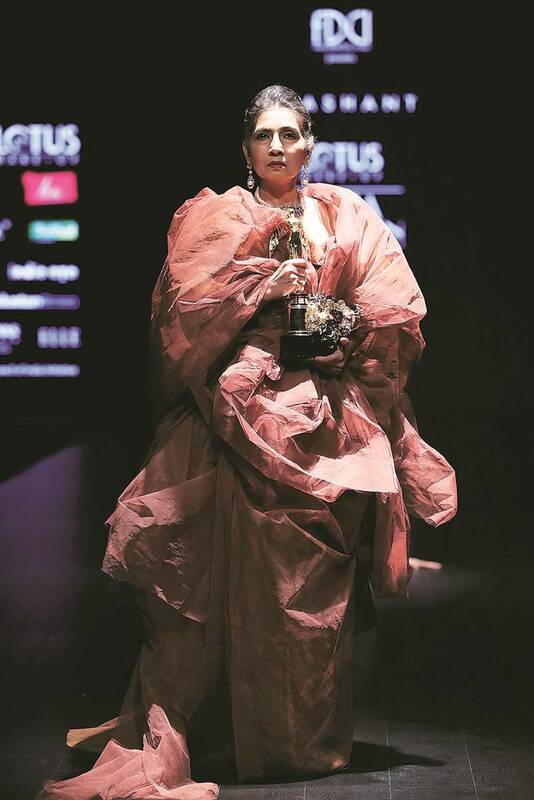 Not only were A-list designers conspicuous by their absence but the grand finale and its theme too were under wraps. The Etu Show, from the Jakarta Fashion Week, cancelled last minute and the other shows of the evening were delayed at least by an hour. Amit Aggarwal’s offering in black. One can always expect food for thought with Pranav Mishra and Shyma Shetty’s label HUEMN, and they didn’t disappoint. This time they took the cause of the Kashmiri youth. Their show HUEMN’s Fall 19 was inspired by the duo’s travels to Kashmir, and they juxtaposed the raw energy of the youth, with the serene backdrop of the Valley. There were landscapes, and flora and fauna on their creations. Staying true to their anti-fit and androgynous narrative, HUEMN blended rubber and leather in their style story. One saw long-sleeved sweatshirts, bombers, tunic dresses and trousers, in vibrant shades — a welcome change from their otherwise dark colour pallets — teal, burnt Sienna, olive and black. One also saw echoes of the ‘sneaker culture’, which was dominant in the ’90s, which they appropriated by adding leather leg warmers. Meanwhile, designer Prashant Verma, brought his love for the performing arts to the ramp with The Miracle Show, a theatrical presentation, which had him sitting on the runway and singing a Harold Arlen classic Over the rainbow. Models danced their way on and off the ramp, wearing oversized, dramatic Victorian-era gowns in velvet and sheer fabrics. Verma used models from all age groups, from a 10-year-old boy to older men and women. Designer-duo Pankaj and Nidhi presented their Autumn Winter ’19 collection in an open arena, with a square ramp walk. Inspired by Still Life with Flowers in a Glass Vase, an artwork by Dutch artist Jan Davidsz de Heem, the line used shades of black, maroon, salmon and forest green on capes, jackets, dresses, skirts and stand-alone pieces. One saw a lot of geometrical texturing, intricate trapunto quilting — a signature of the duo — and trellises that embellished the ensembles. Highly detailed faux-leather cutwork, sequinned petals and cutwork added an extra layer of glamour and drama to the collection. Taking cues from Mumbai’s fashion weeks, there were Bollywood appearances too. Besides Sarbh, there was actor Radhika Apte, who wore an all-black ensemble for designer Pawan Sachdeva. Producer Guneet Monga, who is riding high on the success of Period. An End of a Sentence at the Oscars, walked for designer Rohit Kamra, who had also roped in actor Aparshakti Khurana for his show. Diana Penty and Aditi Rao Hydari too walked the ramp for the finale. The grand finale for the LMIFW AW19, was titled #sixyardsof and had 21 designers present their interpretation of the sari. While some stuck to their oeuvre and played with texture and fabrics, some really pushed beyond the six yards with its drape. 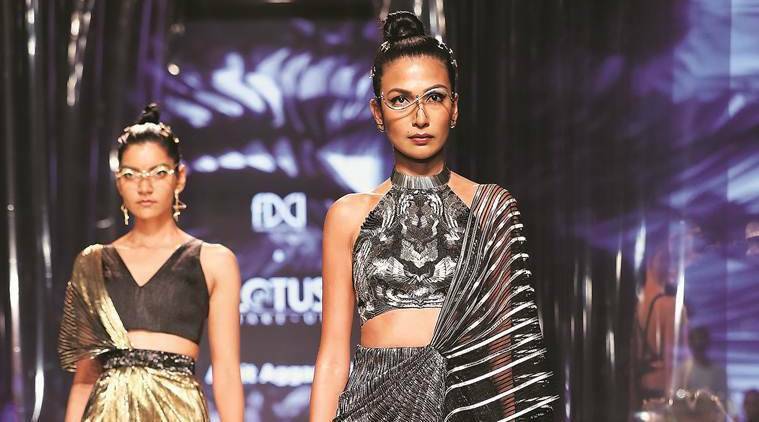 Wendell Rodericks presented a yin-and-yang sari in black and white, where the drape was fashioned over a bodycon swimsuit, making it fit for a day on the beach. Amit Aggarwal brought structure and definition to the otherwise fluid drape, with two gold and black offerings. Little Shilpa, the label of Shilpa Chavan, who is primarily a milliner, presented three looks, and topped them off with a dramatic head gear — which will not look out of place in a Game Of Thrones episode. Additionally, she also had a male model wear the sari, where the pallu was draped around the neck.